Considering I never really got into electronics when I was working in the field straight after leaving school, the release of the Arduino and Raspberry Pi boards have piqued my interest and I have been curious to see what I can do with them. For more information on the original build, check out the video; there is also a breadboard layout sheet available for download. Anyone who has gone through all this already and has experience with Arduino and setting up circuits has probably disappeared off already, so what follows should hopefully help those of you as new to this as I am. * it is always good to define. * the function we call the cylonFade() function. * in one direction, then the other. * not matching the current LED pin. Okay, it's nothing special, and there are probably slicker ways to write the code, but this is as much about getting familiar with the environment and the electronics as anything. 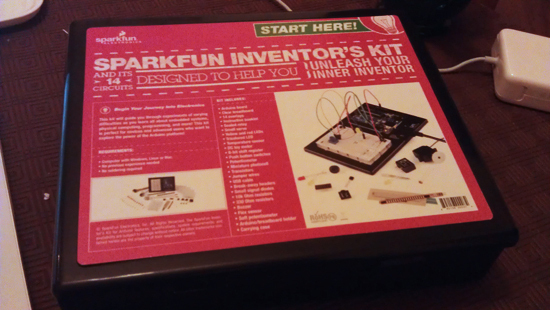 Oooh flashing lights :-) shame the Sparkfun Inventors Kit isnt sold anymore.... they do have an Arduino inventors kit though https://www.sparkfun.com/products/10173 just not in a nice case by the looks of it. Try Hobby Electronics. Mum got mine from there only last week and it arrived the next day!